SF Bay Area home prices are starting to drop and they already dropping sharply. Very soon SF Bay Area will become a buyer’s market. In San Francisco Bay Area, where the average home price is $1.5 million and the average income is $175,000 per year. Given a person’s typical HOA fees, homeowner's insurance costs, credit card and car debts, the average homebuyer can afford just a $778,000 home, nearly 50% below the average priced $1.5 million home. As result the home prices started to revert to their fundamental values and they started to do it really fast. 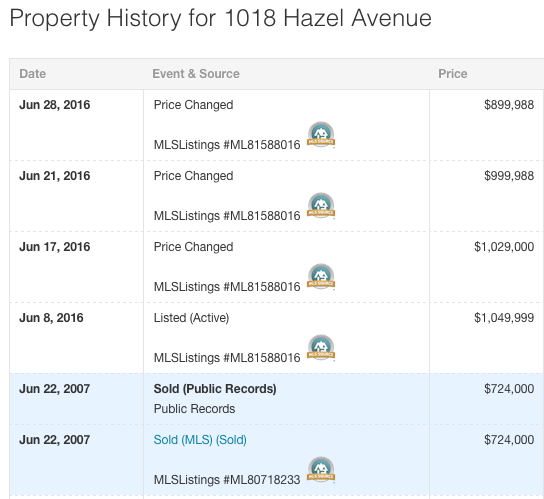 For example, 3 bedroom/2 bathroom home located on 1018 Hazel Ave in Campbell was offered almost two month ago for $1,049,999 and now almost two month later it still on the market, but the price was lowered several times already and the current asking price is $899,988. That's $150,000 or almost 15% down. Could you image it last year? By the way this house was sold for $724,000 in 2007 on the peak of San Francisco Bay Area real estate bubble. Technically the home price surpassed 2007 peak levels, but the home is not sold yet.